A preschool playground is a great place to set up a city. Creating a city outdoors is a wonderful thing that can be done simply with cardboard boxes. Children can decorate the boxes and cut out doors and windows. Then you can put these items along your bike path. Name your streets and label them, which will help with literacy. 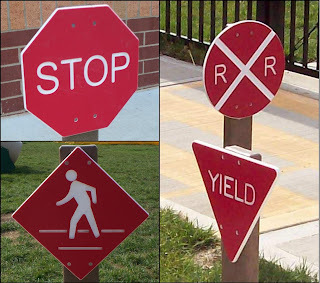 By using signs such as crosswalk, stop, railroad, and yield signs, children will have an opportunity to meet the early learning standard of recognizing environmental print. Take chalk outside and have children actually chalk crosswalks and parking spaces onto your concrete surfaces. They can even create a wheelchair spot, mimicking real life parking lots. Have fun with your bike path and incorporate it into your playground as if it were a city street. Let me hear your comments about unique things you have done with your bike path.